1. 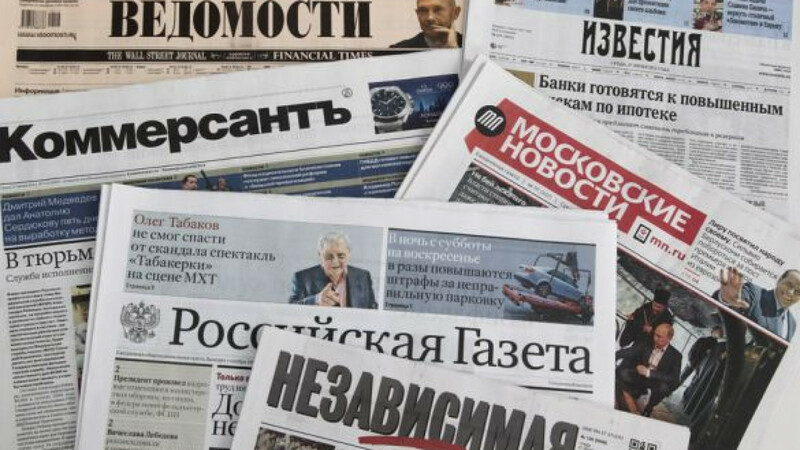 Maxim Ivanov and Anna Pushkarskaya article headlined "Filter Goes to All-Russian Distribution" says the Russian Central Elections Commission wants to make the signatures of support by municipal deputies obligatory both for regional and federal elections. The opposition is against the plans; pp 1, 3 (899 words). 2. Khalil Aminov article headlined "Awful Estimate" says the Audit Chamber has claimed that 15 billion rubles has been used ineffectively during the preparation for the Asia-Pacific Economic Cooperation summit in Vladivostok. Moreover, most facilities were built without relevant documents; pp 1, 12 (635 words). 3. Vadim Visloguzov article headlined "Everything in Budget Is Like in Real Life Now" reports on amendments to the 2012 budget passed by the State Duma; pp 1, 6 (885 words). 4. Ksenia Dementyeva article headlined "Delay With License" says the Russian Savings Bank Sberbank is selling its debts only to the companies having banking licenses; pp 1, 9 (736 words). 5. Dina Polina article headlined "Democracy More Valuable Than Money" says that an increasing number of Russians are demanding democratic changes in society rather than personal wellbeing. This conclusion was made at a conference in Moscow; p 2 (516 words). 6. Ivan Safronov article headlined "Defense Minister Chooses Head of Finances and Arms" reports on the appointment of deputy defense ministers in charge of finances and armament; p 2 (603 words). 7. Anna Pushkarskaya article headlined "Constitutional Court Looks Into Bottleneck" says the Constitutional Court has started hearing a complaint filed by opposition lawmakers against the so-called "municipal filters" in the law on governor elections; p 3 (747 words). 8. Musa Muradov article headlined "Ramzan Kadyrov and Yunus-bek Yevkurov Clash at Funerals" says that Ingushetia head Yunus-bek Yevkurov has slammed Chechen leader Ramzan Kadyrov over a new practice in the republic not to bury militants at official Muslim cemeteries; p 3 (502 words). 9. Dmitry Malkov article headlined "Treason Changed for the Better" says a court in Krasnoyarsk has released on parole physicist Valentin Danilov, convicted of spying for China in 2004; p 5 (511 words). 10. Yelena Chernenko article headlined "MI5 Prevents Leak From Submarine" says that a British submariner, who has admitted breaching the Official Secrets Act by collecting coding programs that could be useful to Russia, could commit the crime because he was displeased with the UK government cutting funding for the Navy; p 7 (435 words). 11. Pavel Tarasenko article headlined "Britain Keeps Al-Qaida's Cleric" says that Muslim cleric Abu Qatada, believed to be Osama bin-Laden's right hand, has won his deportation appeal and has been released from custody in the UK; p 7 (487 words). 12. Georgy Dvali interview with Georgian Foreign Minister Maia Panjikidze speaking on foreign policy priorities for the new Georgian authorities; p 8 (826 words). 13. Sergei Strokan article headlined "U.S.A. Launches War With Unfaithful Ones" says that the scandal involving former CIA Director David Petraeus and the top U.S. commander in Afghanistan, Gen John Allen, is likely to affect the U.S. policy in security sphere; p 8 (790 words). 14. Article by political scientist Dmitry Oreshkin in opinion column headlined "Price of Issue" compares the U.S. scandal with the CIA director with the dismissal of Russian Defense Minister Anatoly Serdyukov and notes that Russian media outlets were allowed by the Kremlin to slam Serdyukov, while in the U.S.A. mass media do not need any permission to do their work; p 8 (391 words). 15. Kirill Melnikov report "TNK-BP Shareholders Leave Court" says that TNK-BP's shareholders, the companies AAR and BP, have settled the legal conflict; p 9 (600 words). 1. Ivan Rodin and Alexandra Samarina article headlined "City Heads on Short Leash" says the Kremlin is amending the government's bill on mayoral elections. The new version of the bill will not make mayoral elections obligatory; pp 1, 3 (1,132 words). 2. Anastasia Bashkatova article headlined "Cat as Sign of Wealth" questions the criteria used by the Institute of Economic Politics in Moscow used to evaluate people's living standards. According to a report by the institute, the number of poor people reduced from 42 to 18 million in 10 years; however, the report took into consideration pets as a sign of personal wellbeing; pp 1, 4 (948 words). 3. Ivan Rodin article headlined "Duma Slightly Amends Constitution" says the Communists want to amend the law that bans people with conviction record from standing in elections; pp 1, 3 (513 words). 4. Vladimir Mukhin article headlined "Medical Diagnosis to Serdyukov's Reforms" says new Defense Minister Sergei Shoigu is cancelling unpopular decisions made by his predecessor Anatoly Serdyukov. The new minister cancelled plans to relocate the Military Medical Academy from the centre of St Petersburg to a remote district; pp 1, 3 (537 words). 5. Yury Roks article headlined "Ivanishvili Accuses Saakashvili of Lying" says Georgian Prime Minister Bidzina Ivanishvili is visiting NATO headquarters amid the alliance's concerns about the political situation in the country, as President Mikheil Saakashvili complained about persecution of his allies; pp 1, 7 (645 words). 6. Nikolai Surkov article headlined "Ambiguous Moves Expected From Obama" says that changes in the U.S. foreign policy are expected after Barack Obama's re-election. Moscow may hope to reach a compromise in the missile defense issue; pp 1, 8 (590 words). 7. Editorial headlined "Re-Estimation of Export Revenues Is Needed" says the current economic trends have shown that Russian hydrocarbons export will fall and urges the government to revise the budget policy; p 2 (518 words). 8. Oleg Nikiforov report "Totalitarianism as Way of Thinking" says that growing totalitarianism in Russia is rooted in the Soviet past; p 2 (600 words). 9. Igor Naumov article headlined "Gold Standard of South Stream" says the construction of the South Stream gas pipeline has de facto started in the Krasnodar region, although the project is likely to cost 100 percent more than initially expected; p 4 (672 words). 10. Alexei Gorbachev report "Reset Fails, So Far" says that Georgian Prime Minister Bidzina Ivanishvili has paid his first foreign visit to Brussels. Georgia aims to expand cooperation with NATO, while one should not expect diplomatic relations with Russia to be restored in the near future; p 7 (600 words). 11. Vladimir Skosyrev article headlined "U.S.A. Leaves Afghanistan to Stay" says that Washington plans to keep its influence in Afghanistan and step up its presence in Asia in general; p 8 (454 words). 12. Artur Blinov article headlined "Generals Under FBI Surveillance" gives details of the scandal involving former CIA Director David Petraeus and the top U.S. commander in Afghanistan, Gen John Allen; p 8 (598 words). 1. Dmitry Kazmin et al. report headlined "Return to Taxes" gives details of yet another criminal case connected with former Defense Minister Anatoly Serdyukov. Olga Stepanova, head of a tax inspectorate, is suspected of involvement in illegal tax evasion schemes; p 1 (632 words). 2. Irina Kezik and Margarita Lyutova article headlined "March of Optimists" looks at Rosneft's plans to invest around $638 billion in 10 projects. The plans are feasible at the current level of oil prices, the authors note; p 1 (387 words). 3. Irina Novikova and Yevgenia Pismennaya article headlined "Infringers Not to Be Assessed" says the authorities are considering a proposal by United Russia to reinstate the system of marks that the motorists, who violate safety regulations, receive; p 1 (438 words). 4. Editorial headlined "Violate Law in More Careful Way" looks at administrative cases opened by the Russian police and notes that new Interior Minister Vladimir Kolokoltsev will benefit from the prosecutor-general's inspection of the cases; pp 1, 4 (494 words). 5. Another editorial headlined "Cossacks Instead of Nashi" says that the Nashi movement has failed as the Kremlin's project; the authorities stake on Cossacks as their new allies; p 4 (329 words). 6. Andrei Kolesnikov commentary headlined "Political Economy: United Court Corporation" comments on the planned merger of the Russian Supreme Court and Supreme Arbitration Court and their relocation to St. Petersburg; p 4 (425 words). 7. Igor Tsukanov article headlined "Figure of Week: 41 Websites" comments on the closure of websites as the new law on harmful information in the Internet has come into effect in Russia; p 4 (345 words). 8. Irina Kezik and Ksenia Dokukina interview with Energy Minister Alexander Novak speaking on Russia's plans for hydrocarbons extraction in the Arctic shelf and risks of petrol deficit; p 7 (4,750 words). 9. Ksenia Boletskaya report "President From Telecom" says that former VimpelCom manager Vladimir Ryabokon will become new president of the media holding company Profmedia, which belongs to Interros; p 14 (600 words). 10. Alexei Nikolsky report "Financiers, Go Forward" says that the team of new Defense Minister Sergei Shoigu may include the officials who are his associates. His longstanding associate Ruslan Tsalikov may be in charge of the ministry's finances; p 2 (550 words). 11. Yevgenia Pismennaya report "Medvedev's New Format" says that Prime Minister Dmitry Medvedev wants to address the government. The goals for the period until 2018 have been set, but so far, there is no answer as to how to achieve them; p 3 (600 words). 1. Oleg Vobyov article headlined "Bridge to Sakhalin Becomes 100Bln Rubles More Expensive Within Year" looks at plans to connect Sakhalin Island with the mainland; pp 1-2 (600 words). 2. Anastasia Alexeyevskikh article headlined "Banks to Tell America About Clients via Federal Tax Service" says the Russian government is to sign an agreement with the U.S.A. as part of the law against money laundering coming into effect in the U.S.A. in 2013; pp 1, 3 (650 words). 3. Pyotr Kozlov article headlined "Political Strategists to Be Taken Under Control" says that Russian political strategists will be made to pass special tests to get certificates allowing them to take part in election campaigns; pp 1, 3 (600 words). 4. Svetlana Basharova article headlined "Migrants With HIV Not to Be Allowed to Enter Russia" says the Moscow city authorities have come up with an initiative to prevent HIV positive migrants from coming to work in the city; pp 1, 3 (600 words). 5. Vladimir Gusev report "Investigative Committee Bans Human Rights Council From Meeting Razvozzhayev" says that the Investigative Committee has not allowed members of the presidential human rights council to meet opposition activist Leonid Razvozzhayev, charged with preparing mass riots; p 4 (600 words). 6. Alexei Bayev report "India to Come to Afghanistan With Russia's Help" says that Delhi needs Moscow as an intermediary and an ally; p 5 (700 words). 7. Ivan Cheberko report "Roskosmos Takes Revenues Away From Foreign Middlemen" says that the Russian Space Agency has begun to implement plans to set up a body to coordinate the activities of Russian space companies on the international market; p 8 (600 words). 8. Alexander Pavlov report "Is Time of Hatred Gone?" looks at a scandal involving the Russian on-line encyclopedia Lurkmore; p 9 (700 words). 1. Natalya Kozlova interview headlined "Bastrykin's Piramidon" with Investigative Committee head Alexander Bastrykin speaking on measures against the organizers of financial pyramids; pp 1, 7 (900 words). 2. Pyotr Orlov article headlined "Do Not Go to Bond" comments on the new law on treason that comes into effect in Russia; pp 1, 5 (600 words). 3. Tatyana Zykova interview with Yury Chikhanchin, head of the Russian Federal Service for Financial Monitoring, speaking on the bills aimed against money laundering and financing terrorist activity; pp 1, 5 (800 words). 4. Natalya Kozlova interview with Natalya Antipina, acting head of Rosreestr, the Federal Registration, Cadastre and Cartography Service, speaking on registering housing and other property in Russia; pp1, 7 (900 words). 5. Fedor Lukyanov article headlined "Razor Edge" looks at the atmosphere in which the Chinese Communist Party congress is being held; p 2 (800 words). 6. Alexei Chesnakov article headlined "Show Must Go On" outlines measures that could be taken to make election procedures more legitimate and popular in Russia; p 2 (800 words). 7. Yury Gavrilov article headlined "Double Shot at Pirates" says that detachments of ships of Russia's Pacific Fleet and Black Sea Fleet will be engaged in anti-pirate operations in Africa; p 8 (700 words). 8. Olga Dmitriyeva article headlined "He Starves London Out" says that radical Muslim cleric Abu Qatada has won his deportation appeal and will stay in London; p 8 (600 words). 9. Yevgeny Solovyov article headlined "Who Is Who in Beijing" looks at the Chinese leadership and reshuffle to be held in the Chinese Communist Party's political bureau; p 9 (600 words). 1. Lina Panchenko article headlined "Crackdown on Mafia of Slave Owners in Moscow" reports on a criminal group that has kept migrant workers as slaves in Moscow. The police close a blind eye to the problem; pp 1, 7 (2,228 words). 2. Anastasia Rodionova article headlined "Udaltsov's Personal March" says the opposition plans to stage another protest on Dec. 8; pp 1-2 (517 words). 3. Yulia Kalinina article headlined "Deadly Dangerous Quote" slams the Russian authorities' plans to classify information on the rampage committed by a Moscow office employee and other similar crimes as people will not be informed about threats they may face; pp 1, 3 (557 words). 4. Mikhail Delyagin article headlined "Corruption From Top to Impossible Level" looks at the scale of corruption with budget money spending in Russia and predicts collapse of the current regime; pp 1, 3 (1,053 words). 1. Alexander Litoi and Ivan Petrov article headlined "Disagreement and Appeals" says the leftist Left Front organization has been put under pressure by the authorities, as its members are complaining about questioning and threats by the police. The organization may be closed, the authors believe; pp 1-2 (600 words). 2. Yulia Yakovleva article headlined "All on to One" says that Yevgeny Royzman, head of the Yekaterinburg-based City Without Drugs foundation that is suspected of having kept people by force, has said at a news conference that he is going to continue his work regardless of the pressure from the authorities; p 2 (500 words). 3. Ivan Petrov article headlined "One Kolokoltsev, Many Policemen" says that checks have shown that new Interior Minister Vladimir Kolokoltsev has failed to reduce the number of violations in the police; p 2 (600 words). 4. Margarita Parfenenkova article headlined "Health Ministry Fails HIV Test" says that the former health minister and her team are suspected of fraud; p 9 (500 words). 1. Pavel Felgengauer article headlined "Russian Arms Kickback Gets Stuck in Iraq" comments on a corruption scandal involving Russia's arms deal with Iraq; p 14 (733 words). 2. Andrei Kolesnikov article headlined "Operation 'Doctors'" looks at the purge launched by President Vladimir Putin among the ruling elite and notes that the campaign is unlikely to save his regime; p 2 (793 words). 3. Sergei Kanayev article headlined "God's Son" reports on the situation in Moscow Region to be headed by United Russia member Andrei Vorobyov; pp 2-3 (1,724 words). 1. Nadezhda Krasilova article headlined "Lawful Doubts" says that newly elected members of the presidential human rights council doubt that amendments to controversial Russian laws will be introduced, although they raised the issue with Putin and he reacted quickly; p 2 (700 words). 1. Yevgeny Arsyukhin et al. interview with Agriculture Minister Nikolai Fedorov speaking on his work and plans to improve living standards in Russian villages; pp 12-13 (2,656 words). 2. Alexander Kots and Dmitry Steshin article headlined "Who Turns Dagestan Into Outpost of Wahhabism" continues to look at journalists' investigation as to what makes young Dagestani men turn to ideas of radical Islam; p 10 (1400 words). 1. Andrei Gavrilenko article headlined "At Ocean's Large" says that Russian warships of the Black Sea Fleet and the Pacific Fleet continue executing their tasks of long-distance voyages in the Aegean Sea; p 1 (500 words). 2. Viktor Ruchkin article headlined "Opposition Threatens Other Countries" says that having failed to overthrow President Bashar Assad, the Syrian opposition has distributed an ultimatum demanding that all foreign diplomatic missions and international organizations stop their work in Syria; p 3 (800 words). 3. Interview with military prosecutor of the Russian Strategic Missile Forces, Maj-Gen Vladimir Samsuyev, on the latest fraud and corruption scandals within the armed forces; p 4 (1400 words).